I made it! And so did you. I’ve been joining the Slice of Life challenge for 8 years now and always breathe a sigh of relief on March 31st. Some years, and this one included, I will keep going through the month of April with daily poetry writing. Some of my fellow slicers have written reflective posts about their learning. Terje has been writing for nine years, so she did nine things she learned. Elisabeth inspired Terje’s post with Four Things I’ve Learned in Four Years of Slicing. And Lisa, who I think started this whole idea, wrote Six Things I’ve Learned in Six Years of Slicing. I am not alone. Writing in a community of writers makes my work and my words worthwhile and valued while. at the same time, I feel a sense of obligation to be the best writer I can be. The feedback encourages and uplifts me. I also make friends along the way. People I may meet some day or not, but even so, we are friends. Writing makes writing easier. Opening the blank page on my blog used to fill me with fear. I’ve learned that there is always a back button, a move to trash option. The more I write, the more I find to write about. The world is my open for my noticing. There is big magic waiting to be written. Readers appreciate honesty. Some of my most successful posts (if I take the time to look at the stats) are ones in which I put my heart on the page. There is camaraderie in sharing the vulnerable moments of your life. I’ve learned that readers want to connect in some way. The best way to connect to someone else is to be honest. There is room for lots of voices. I don’t even know how many people are doing the SOLC this year, but I know it’s a lot. And there is no way I can read and comment on all the posts, but that’s OK. There is room enough for all of our voices. My go-to writing is poetry, and I’m OK with that. I can always count on a poem coming to visit me, so I’ve stopped making excuses for it. I am a poet; There, I said it. I have time to write. I stole this one from Elisabeth, but it rings true for me, too. People always ask me, “How do you find time to write?” I don’t stay up late. I do get up early, but most of the time, I carve out the time and it works. I am currently writing at Whole Foods outside in the breeze with a vanilla latte’. This makes me happy! A teacher of writing must be a writer. I’ve heard this over and over. Now I live it. I am a better teacher because I do this every day. I know how it feels to be vulnerable with my writing. I know how good comments feel. I am a writer, and it makes a difference. Slice of Life is not just for a month. The people I’ve met here become lifelong friends and even writing partners. If you sliced this year, don’t go away. Stay and write at least once a week on Tuesdays. You will be glad you did. Thanks for reading my daily posts. 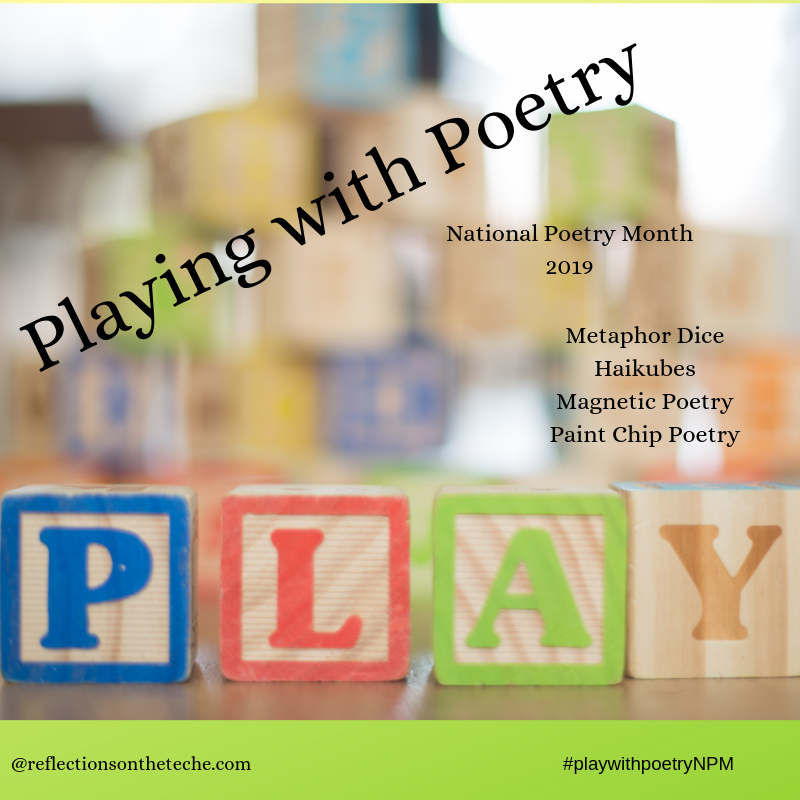 And now…Playing with Poetry Time!